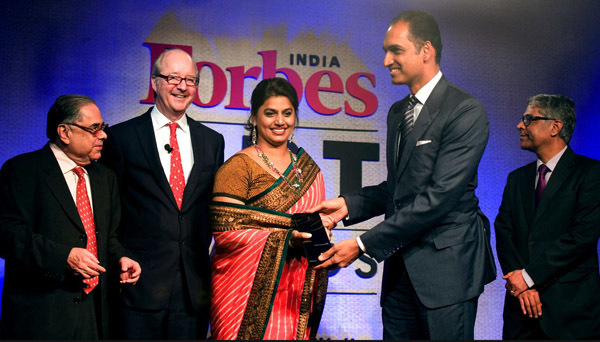 The first edition of the Forbes India Art Awards concluded on 31st January 2014, unveiling winners across 14 categories from the world of Indian art. The Forbes India Art Awards (FIAA) is a first is a first of its kind initiative in the Indian art world. Speaking at the event, R. Jagannathan, Editor-in-Chief Forbes India, said “We at Forbes India believe that this initiative is unique in India. While there other awards that acknowledge artistic and aesthetic achievement, FIAA is India’s first award that acknowledges the contribution of all stakeholders in the art value chain. This includes galleries, curators, writers, collectors, corporates, non-profit initiatives and of course, the artists themselves” The awards considered all types of art including painting, sculpture, mixed media, video, photography and performance art from across the country. The Forbes India Art Awards has multiple objectives. First, the need to acknowledge contributions by the entire art ecosystem and not just the artists themselves. The second objective is to create and sustain a dialogue about the importance of art in everyday life and in public spaces. Forbes India believes that the experience of art enriches us as a pluralistic society. Both Indian corporates and government have very little involvement with the art world. One of the objectives of FIAA is to create a platform for interaction between India’s corporates and the Indian art community. The final objective of the FIAA is to create awareness amongst the public at large about all the different stakeholders in the art industry. Many people think art is simply a solo creative activity. In reality it requires many people to create and sustain an artist’s work. An advisory council comprising of Neha Kirpal, founder of India Art Fair, Dinesh Vazirani, CEO, Saffronart and Suresh Venkat, Consulting Project Editor, Forbes India was constituted to map out the Indian art landscape. In order to create a robust and transparent award, Forbes India partnered with audit firm KPMG who monitored the process at every stage to ensure fairness and transparency. FSCA, a leading art consulting firm headed by Farah Siddiqui was entrusted with the task of researching, verifying and compiling data on all the nominees across 14 categories. Bangalore based Studio ABD was commissioned to design a trophy that reflected the spirit of the awards. And the Leela Palace, New Delhi was chosen a venue partner because of the Leela Group’s enduring commitment to the cause of art. The Forbes India Art Awards is, in large part aimed at identifying new and emerging talent in the art world. Hence many of the categories focus only emerging contenders and not the established players in the market. Hence the FIAA has awards for young collectors, young galleries, young writers and new initiatives. Young Collector of the Year: Anurag Khanna. For his commitment and risk taking ability in collecting different types of art including video art. Contemporary Gallery of the Year – Experimenter, Kolkata. For their work in highlighting experimental and alternative artists from the entire South Asian subcontinent. Gallery of the Year – Talwar Gallery, New Delhi. For their ideological and visual spectra expressed through the gallery’s exhibitions in 2013 that have been well received by the international media and major museums worldwide. Not-for-Profit Art Initiative of the Year – Foundation for Indian Contemporary Art (FICA). For their work in encouraging, promoting and supporting innovative work in the field of the visual arts. first auction in India, south Asian Art December 19, 2013, Mumbai. Emerging Art Writer of the Year: Jyoti Dhar. Jyoti Dhar is an independent art writer and curator based in Delhi. She is currently the contributing editor for ArtAsiaPacific and Harper’s Bazaar Art. Contemporary Artist of the year (Mid Career): Subodh Gupta. Gupta’s works are littered with references to past and present experiences. His constructions weave highly eccentric imaginings with public myths and rituals. Drawing mainly from everyday objects and scenarios, his aesthetic delineates the complex inter-relations of India’s urban and rural communities. Contemporary Artist of the year (Junior): Rohini Devasher. Rohini Devasher’s artistic practice explores the interface between the underlying laws and processes that govern growth and form in biological and physical systems and their mirroring in the digital domain. the fair’s unprecedented growth over six years into becoming the premier destination for art in the region. Art Initiative of the Year: Google Art Project. Google Art Project is an online platform through which the public can access high-resolution images of artworks housed in the initiative’s partner museum.